Game description: Join two heroes, Darc and Kharg, on their quest to capture the Great Spirit Stones, a resource sought by two warring races. Twin brothers separated at birth, Darc and Kharg come from different backgrounds--one has suffered great hardship, and the other seeks to uncover his mysterious past. 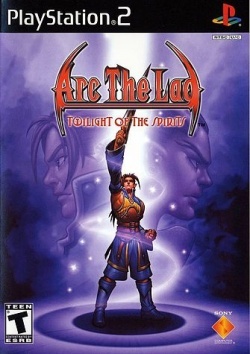 Arc the Lad: Twilight of the Sprits features an epic storyline, a dynamic battle voice-over system, and strategic combat sequences that will immerse you in their adventures. Arc the Lad: Twilight of the Spirits is the prequel to Arc the Lad: End of Darkness. • Speedhacks VU Cycle Stealing 2 • ZeroGS worked fine but slower than GSdx (and sometimes faster...). • ZZOgl worked fine too. but slower than GSdx (and sometimes faster...), to fix text use resolve hack 1 in graphics plugin. There are some parts where it slows down, but it is very short areas and maybe experiment with speedhacks to solve it. There are some parts where it slows down, but it is very short areas and maybe experiment with speedhacks to solve it. Description: In hardware mode, there's patches of either white fog (DX10) or grey fog (DX9) in some areas. Workaround: Use OpenGL Hardware renderer and enable Hardware Depth, or with DX renderers switch to software mode(f9) and back to hardware should remove the fog. Description: May show some SPS from time to time. Workaround: Use only microVU and don't change the clamps from "Normal".